Note: This Blog post is now deprecated. While I encourage you to use Ghost, Azure has since changed their system since the initial authoring of this post, and it is therefore no longer as relevant. This past weekend, I successfully set up this blog with the help of a variety of sources, especially Cho S. Kim's blog post on the same topic mentioned here. This guide offers a modified and updated process based on the newer versions of Ghost with a few bug fixes. To set up ghost, you'll need to install Node.js. You can do this with a Homebrew command: $ brew install node or downloading it from their website. Also make sure that your npm is up to date if you already have node. For this process, I'm running Node-0.10.31. You will likely also need homebrew, so make sure you have that installed. 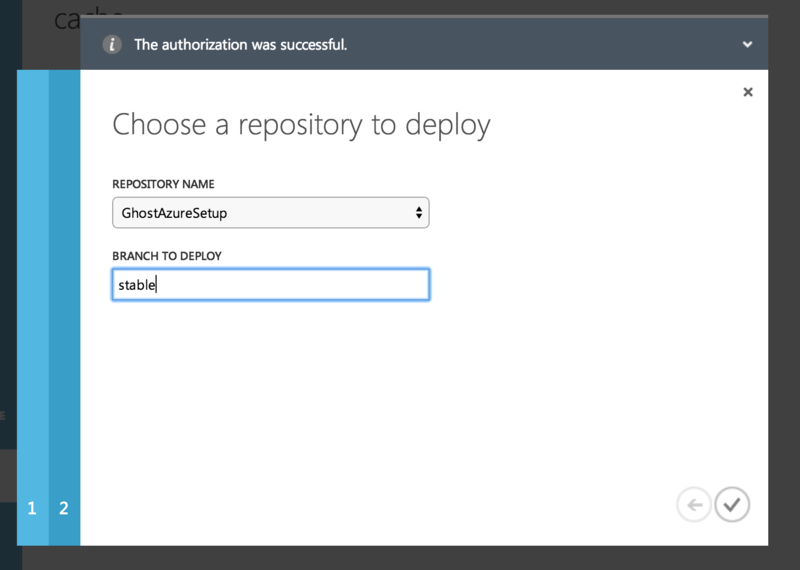 Recommended: Because a variety of changes are necessary to make the regular ghost repository play nice with Azure, I recommend forking my Azure-ready repository here. This repo is ready to go on Azure and requires no changes before this setup process. It also will not break due to unforeseen updates by the Ghost team. Fork my repository to your own account. Next, we need to check to make sure Ghost runs properly on a local server. To do this, we need to run a few commands in our Ghost repository. # Install grunt's command line interface to # use it-requires node/npm to work. # Install all ghost dependencies. # are running a recent version of node. Hooray! The local server is running! On the next popup window, choose the name of your website, specify no database, and be sure to check the box titled "publish from source control." Now, Azure will create the website on your behalf and sync it with your personal repository. That means every time you push to your repo, it will deploy to the site. It's pretty cool. Save your changes with the save button at the bottom of the page, and then navigate to your site's dashboard. On this page, you should look for a button along the right column titled "Reset Your Deployment Credentials." It's along the right side of the image below. (Note: there is a chance that it will show "set up deployment credentials instead." If this is the case, just do that, though it's not always essential). After you enter your information, press submit and you're ready to go! Navigate to your config.js file in the GhostAzureSetup directory. Here, you should change the production and development urls to the domain of your new azure website. In the repo, both are currently listed as "http://yourawesomewebsite.azurewebsites.net/"
After you've changed the values, your site will deploy in the right location. Our next step is to push our changes to git, which will be automatically deployed. Note: Some have encountered an error here that is related to the core/built/scripts files when they run a git add. I've included a fix in the commands. # commands. Otherwise, skip to the commit. # We need to convert our /core/built/scripts # files from dos2unix. # To do so, we will use the dos2unix command. # ran the last command). # End of error fix. $ git commit -m "Built Ghost for production"
If all is well, your azure website will automatically deploy. You can make sure the most recent version is deployed on Azure if you go to your website and click deployments. You should see your most recent commit message and Active Deployment in green. Congrats, you've deployed your website! Now, head over to your domain and check it out (Note: it may be slow at first). Last step! After viewing your website at yourdomain.azurewebsites.net, head, over to the admin page. On ghost websites, this will be located at http://yourdomain.azurewebsites.net/ghost (Note: /admin also takes you there). On that page, register for a ghost account, and you're good to go! Ghost will walk you through it from there. Congratulations! 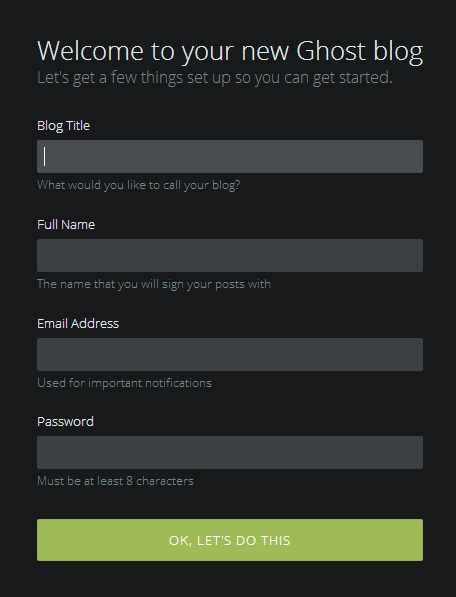 You're ready to blog. Just head over to '/ghost' whenever you want to write a post! Feel free to take a look at the optional Step 6 for things to do next. Good luck! If you have any questions, issues, or anything else, just shoot me a message or I'll answer questions in the comments below.